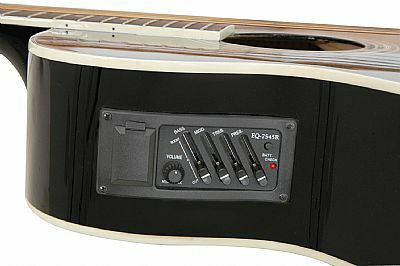 A cutaway electro-acoustic guitar with an active EQ. 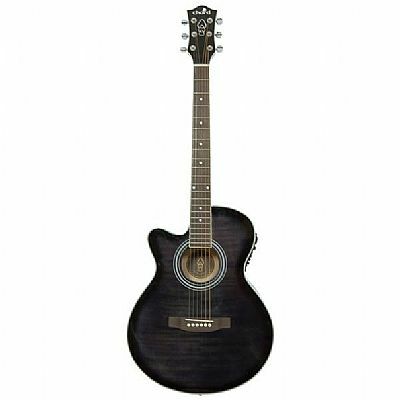 The Chord CMJ4CE is a mini jumbo model with a laminate spruce top and basswood back and sides. The mahogany neck and rosewood fretboard hold 21 frets with easy access by virtue of the cutaway. The under-saddle piezo pickup is served by a top-mounted 9V battery preamp with 4-band EQ. This instrument performs admirably, whether played acoustically or plugged into an amplifier or PA system. Left handed version available at the same price, however stocks are intermittent - please get in touch & we will check stock levels before you order.